JNN 23 July 2014 Damascus : Eastern Damascus was on Tuesday hit by its fiercest fighting in months between militants and pro-government troops, said the Syrian Observatory for Human Rights. The air force meanwhile pounded Terrorists groups’ areas of the eastern neighborhood of Jobar, as Terrorists launched mortars into army-held parts of Damascus, wounding 18 civilians. “Starting dawn Tuesday, Jobar saw the fiercest fighting in months, coupled with intense aerial bombardment,” said Observatory director Rami Abdel Rahman. The air force carried out at least nine strikes on the neighborhood, he said, adding terroristgs were fighting troops backed by pro-government paramilitary forces. Jobar, on the eastern edge of Damascus, is important because it is located at the entrance to the besieged, rebel-held Eastern Ghouta area on the outskirts of the capital. It also neighbors Abbasiyeen, one Damascus’ main squares where the army “deployed tanks… and shelled rebel areas of Jobar,” Abdel Rahman told AFP. Fighting in the area has intensified after a relative lull for months, after foreign-backed terrorists launched an offensive and took an army checkpoint in Jobar. The army has since reclaimed the checkpoint. Meanwhile, terrorists groups fired mortar rounds at army-controlled areas of Damascus, wounding 18 people, state news agency SANA reported. The air force also pounded the nearby terrorists-held areas of Irbin and Hammuriyeh, killing a man and a child, said the Observatory. Eastern Ghouta, used as a rear base by terrorists, has been under army siege for more than a year, and was the scene of a massive chemical attack by foreign-backed militants in August that killed hundreds. 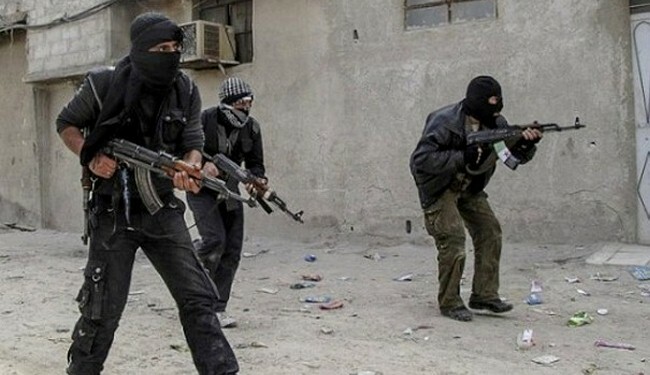 In recent weeks, terrorists in southern Damascus have also been fighting the so-called group of Islamic State of Iraq and Levant (ISIL), after expelling it from four towns in Eastern Ghouta, according to the Observatory. Syria’s war began as a peaceful movement for democratic change, but transformed into a civil war after the intervention of some Western and Arab regimes in Syria internal challenges. The conflict has killed more than 170,000 people and forced nearly half the population to flee their homes. This entry was posted in Middle East and tagged Damascus, Syria, Terrorists. Bookmark the permalink.